It’s safe to assume that the teacher has already had a discussion about online safety with the entire class, but this doesn’t mean you can’t do the same. Take time at dinner or before bed to discuss how proper use of the Internet, both at home and in the classroom. If you want to limit your child’s use of technology, encourage them to seek out non-tech options outside of the classroom, like reading a book, putting together a puzzle or doing art projects. Many studies have found that parent involvement is critical to student success in school: “Increased parental involvement can improve attitude and behavior, including self-efficacy, classroom behavior, personal expectation, motivation and dedication to completing homework,” as reported by FreshGrade.com. One benefit of technology in your child’s classroom is that it gives you an opportunity to become more involved by connecting with teachers. Use the teacher’s use of technology to pave the way for better communication. The best way to become more comfortable with your child’s use of technology in the classroom is to see how it works with your own eyes. A simple conversation with the teacher can shed light on what tools students are using; ask the teacher for access if it’s a gated program, otherwise you can find it online yourself and give it a go. Most apps and platforms used by teachers allow parents to check-in at any time and see what their child is doing. For example, platforms like Whooo’s Reading or Kaymbu are designed to provide parents with insight into what their students are learning throughout the day. Take advantage of this and check in a few times a week. If you’re not already on the PTA, PTO or a board that helps make spending decisions for the school, you may want to reconsider—in most cases, fundraising money goes toward technology for classrooms and you could have a say in how it’s allocated. “As a former chair of student council at her daughter’s Toronto public school, Stacie Smith helped raise more than $40,000. Most of that money went into increasing technology in the classroom, including buying a set of iPads for the kindergarten class, laptops for the grade-six class and SMART boards for the teachers who wanted them,” reported Shawna Cohen of TodaysParent.com. If you become involved with the PTA or PTO, you may have a say in this process, and perhaps even be a decision maker about what tools are being purchased. 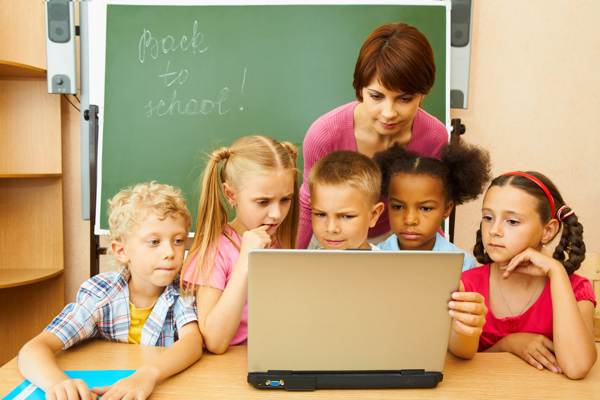 Technology in your child’s classroom isn’t necessarily a bad thing or a reason to worry. However, that doesn’t mean you can’t or shouldn’t be involved. Talk with your child, communicate with teachers, and check in often, all of which will help you feel more comfortable with these tech tools. Bio: Jessica Sanders is the Director of Social Outreach for Learn2Earn, an online fundraising platform that allows students raise money by reading books. She grew up reading books like The Giver and Holes, and is passionate about making reading as exciting for young kids today as it has always been for her. Follow Learn2Earn on Twitter and Facebook, and send content inquiries to social@learn2earn.org.